When you’ve finished your big races for the year, what do you to keep in running shape? It’s so easy to fall back and relax once the race is over, but before you know it, it’ll be time to start training again! When that time comes, you don’t want to start from scratch, so it’s essential that you keep your fitness at a level that will make your training process as seamless as possible. But how do you actually do it?? Today I’m linking up at Wild Workout Wednesday with Annmarie at The Fit Foodie Mama, Angelena Marie at Angelena Marie: Happy, Healthy & Balanced, Michelle at Fruition Fitness, and Nicole at Fitful Focus! Check out their blogs to pick up some awesome workouts! It’s been about 2.5 weeks since my last race, the Annapolis Classic Half Marathon. The next race that I have set in stone is the Credit Union Cherry Blossom Run on April 3, 2016. P.S.- the deadline to sign up for the lottery is this Friday, December 11! Be sure to sign up! Race training for me probably won’t begin until mid- to late-January. So in order to be ready for consistent running, it’s important for me to keep up my fitness as best as possible over the next month! Below are 5 tips that will help you stay fit in the running off-season so that you can hit the ground running for your next training cycle! Running regularly while not training for a race can be a really fun time, if you make the most of it! Look at your week and give yourself a realistic schedule. Create a routine that you know you can commit to. Look at times before, during, or after work hours where you can fit in a workout. Note appointments that you know you can’t miss in advance. I like to look at each week at a time, since so much is always going on! Find a fitness challenge that you can follow daily or weekly. I’ve mentioned that I’m doing the 30 Day Abs and Squats Challenge with Diatta from Femme Fitale Fit Club. 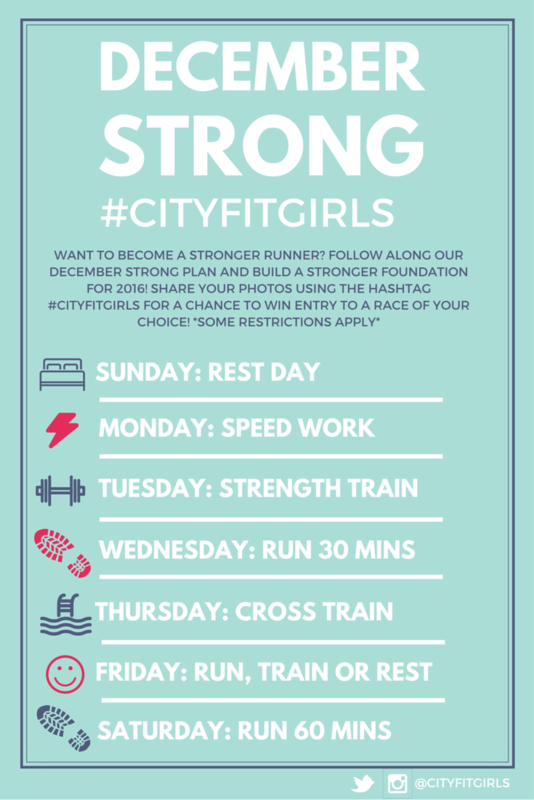 There’s also the SweatPink Holiday Sweat Challenge and the City Fit Girls December Strong Challenge – both are weekly. You don’t have to follow the challenges perfectly, but it gives you a compass to guide you to stay on track. Here’s a great routine created by City Fit Girls! After spending months training for several days a week, running can get a little boring! I know that when I train, running is my #1 priority, and doing other workouts takes a back seat. Now that I’m in the off-season, I can really take advantage of the time to do the other workouts that I enjoy, or I can try something completely new! Bodypump – strength training is so important! Cycling/Spinning – always a great way to cross-train – check out my review from The Wall Cycling Studio in Manayunk! Swimming – works so many muscles! They add variety. If you like to do a lot of things or are interested in trying a new workout, now is a great time to do it. Variety is great because it will also help you work out different areas of your body, which is beneficial to you as a runner. They’re motivating. I know for me, when I work out alone, I don’t push myself as hard. Having a group of people not just watching you but cheering you on and struggling with you really makes a difference. Just make sure that whatever you decide to do, don’t overdo it! Try to be somewhat conservative in your first class to avoid a potential injury, and once you develop your comfort zone, feel free to color outside the lines for a bit! The best thing about not being on a training plan is that you’re free to run when you want and as long or far as you want. But at the same time, you don’t want to push yourself too hard! If you do something like the Runner’s World Run Streak, make sure that you keep your intensity low, especially if you’re prone to injury. Take this time to slow your pace and/or run shorter distances. It’s still a good idea to keep up your long runs, but don’t go too fast! I know from personal experience what it’s like to get injured in the off-season. I was trying to become a “minimalist” runner to “fix” my form, wearing Newtons, and pushing myself way too much on my runs. 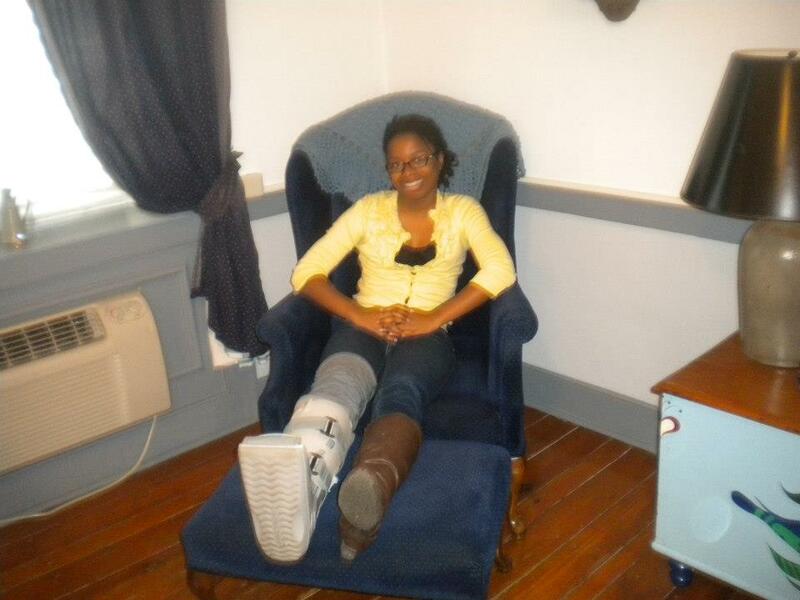 Two months later, I had a stress fracture in my foot, and I ended my season of running before I even started. I essentially lost a year of running. So again – enjoy your runs, but be smart! Training for a race can be really intense, especially if you’re shooting for a PR. The only time you may actually have “fun” training is during a speed workout or if you’re running with a fun group of people. You can get burned out from taking things too seriously…believe me. When you’re in the off-season, it’s so important to get back to FUN running and remember why you do it in the first place. That’s why it’s a great idea to sign up for a fun run during the off-season. You can just show up and run with no pressure! This weekend I’m doing a Rudolph Run, my first holiday 5K. It’s a great way to keep engaged with running, but focus on purely enjoying myself while also supporting a charity. Plus I get a Rudolph nose and jingle bells to wear! In Philly, there’s also a popular Holiday Lights Run that takes people down to South Philly to enjoy the scenery. Take a look and see what fun runs are taking place in your neighborhood, and just join in! If it’s free, even better! When you’re training for a race, you probably give yourself liberties to eat what you want because you’ll just “burn it off”. I know I do! But when the training ends, the overeating needs to end too. Of course, it’s not easy around the holidays when there are so many parties with amazing food and drinks! Don’t deprive yourself too much, but don’t go all-out either! Balance is key! I’ve been working with a dietitian for a couple of years now and I recently checked in with her because I know my bad habits this time of year and needed a swift kick in the pants to remember to eat more veggies and protein and less carbs and sugars. Always listen to your body! All in all, when you’re in the running off-season, following these tips will be SO helpful for maintaining your fitness! Be sure to do what you need to do to keep yourself in check, and once training season kicks in, you’ll be good to go! Wednesday 12/2: Continuation of the abs and squats challenge: 20 sit-ups, 15 crunches, 30 squats! I haven’t done sit-ups in years, I’m just glad I can get through them! Thursday 12/3: I took it as a rest day. I wanted to run, but the temperature has dropped and my cold is still acting up. 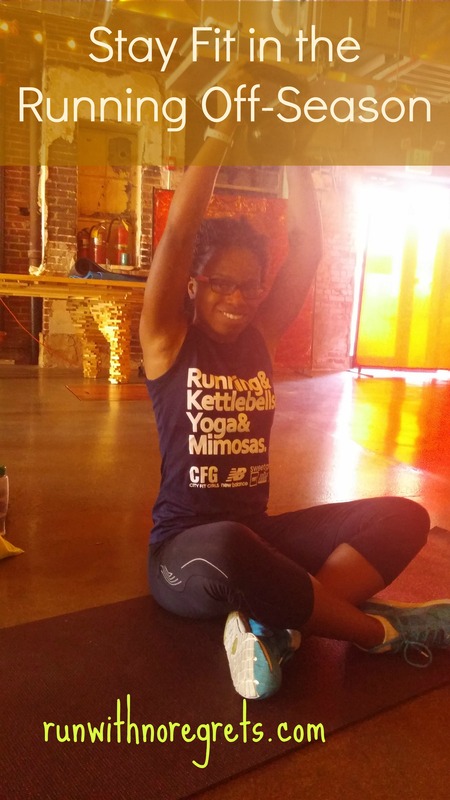 Saturday 12/5: Abs and squats challenge: 10 sit-ups, 25 crunches, 40 squats. Sunday 12/6: Abs and squats challenge: 5 sit-ups, 10 crunches, 20 squats. We had a late night, so we didn’t get to do our morning long run. 7 sets of the following: run up and down the stairs twice, 10 wall push ups. 10 sets of the following: run up and down the stairs once, 10 squats, 8 wall pushups. Phew! I figured I covered my abs and squats for the day! Tuesday 12/8: Core Fusion Class. It was pretty challenging – my flexibility isn’t where I’d like it to be, and getting my breathing right is a struggle. I also ran 3 miles with Shack Track and Field as part of the Running Club Roundup! Check out the recap tomorrow! I ended the night with the abs and squats challenge: 20 sit-ups, 55 squats. What do you do to stay fit in between race training?